3' Watford 0-0 Chelsea: Bad news for Watford fans as Ighalo is limping already - he seems to have shaken off the problem for now, but that would be a huge loss for the Hornets if their star man had to depart injured. 5' Watford 0-0 Chelsea: Ivanovic concedes a free kick out wide but the Blues clear the resulting free kick easily - they break, but Costa is easily dispossessed. Ighalo shows no signs of that early problem as he rides a couple of tackles before winning a corner. 7' Watford 0-0 Chelsea: Willian plas a gorgeous raking ball across the pitch to Azpilicueta and the Blues continue to switch the ball across the flanks, but the Brazilian then flings in a poor cross for a player of his quality. 12' Watford 0-0 Chelsea: No breakthrough for either side yet, but it's a good battle out there so far. 15' Watford 0-0 Chelsea: Watford are holding firm so far, but are struggling to creat anything of note with Chelsea looking strong in defence. Fabregas has freedom in the middle, but Watford seem content to let him look for long balls before heading them away. 17' Watford 0-0 Chelsea: A brief moment of chaos in the Chelsea penalty area as the ball pops up and around before Courtois eventually claims - Watford a little unlucky that it didn't fall for one of their well-placed attackers there. 18' Watford 0-0 Chelsea: First booking of the game as Oscar shows a great turn of pace and Prodl hacks him down - a silly caution to collect so early on. 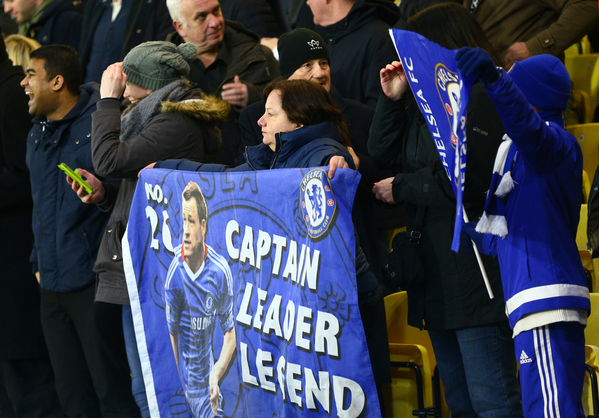 19' Watford 0-0 Chelsea: Now Terry clatters Deeney in an aerial battle and concedes a free kick 30 yards out. Is this in range against a man of Courtois' talents? 20' Watford 0-0 Chelsea: Courtois is quick off his line to claim after the free kick deflects and skids dangerously into the area - Capoue would have been in there against a keeper of slower reactions. 22' Watford 0-0 Chelsea: Watford want a penalty as Jurado goes down in the area after a shove from Matic, but it would have been a weak call - no spot kick given. 24' Watford 0-0 Chelsea: Watford fans are purring after a fine passing move from defence - terrific confidence from the Hornets! What a chance for Ighalo! 26' Watford 0-0 Chelsea: Ighalo really should add to his impressive tally this season, but somehow contrives to miss a free header unmarked from six yards out! Holebas put it on a plate, but the ball just glances off his head. 28' Watford 0-0 Chelsea: Watford should be ahead, but Courtois makes a tremendous save from Capoue's rasping drive on the overlap - terrific play again from the Hornets, but it remains goalless! 33' Watford 0-0 Chelsea: Costa twists and turns on the edge of the Watford area like an aggressive snake, and unleashes a low half-volley which deflects just wide of Gomes' left-hand post for a corner. 34' Watford 0-0 Chelsea: CHelsea are now on top as Oscar's half-volley from 15 yards is blocked out by a defender with Gomes sprawling - the Blues are stepping up the pressure. 35' Watford 0-0 Chelsea: Ighalo performs about eight or nine stepovers in a row 40 yards from goal, but then lazily flicks the ball to his left to concede possession - not his finest hour. 38' Watford 0-0 Chelsea: The Blues are looking for a way through on the left flank, but Watford's pressing means they are forced backwards to their own defence - brilliant work rate from the Hornets, but can they keep it up as the game wears on? 39' Watford 0-0 Chelsea: No way through as Ivanovic sees his cross scooped up by Gomes - neither manager will be particularly disappointed so far, but there's a lack of quality in the final third tonight. 40' Watford 0-0 Chelsea: Holebas goes down the Chelsea area under pressure from Ivanovic and the Watford faithful cry out for a penalty, but Mike Dean says no. Chelsea then win a free kick as Deeney crunches Willian, who goes down clutching his buttock - painful. 41' Watford 0-0 Chelsea: Now it's Azpilicueta's turn to have a go, but the Chelsea left-back skews a poor effort wide from the left of the area with Costa well placed. Not pretty from the defender. 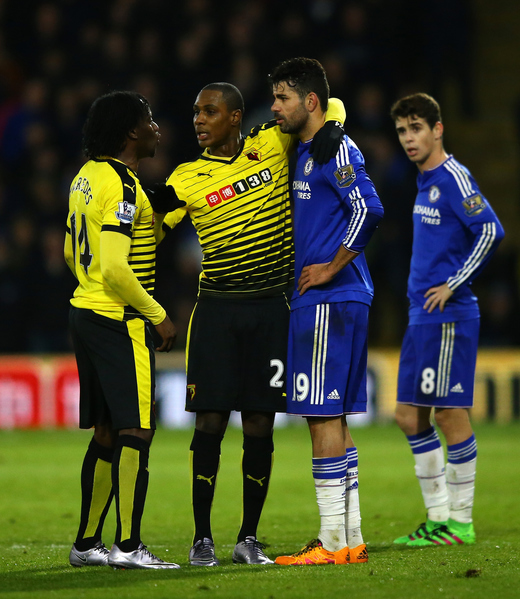 44' Watford 0-0 Chelsea: Controversy now as Paredes goes down in an off-the-ball incident with Diego Costa - who else? - and players from both sides get involved. 45' Watford 0-0 Chelsea: After a lengthy delay, Costa and Paredes are booked. Replays show Costa went down around 30 seconds before he then shoved Paredes over, with the Watford player not covering himself in glory by dramatically clutching his face. A yellow apiece is probably fair. So that's the break at Vicarage Road, where both teams have huffed and puffed but so far failed to blow down any houses. Or score any goals, for that matter. 7 - Watford have conceded just seven goals in the first half of Premier League matches this season; a league-low. Solid. Replays of the first-half chances show that John Terry was caught out when Ighalo missed his sitter - the Chelsea captain was lucky to see the striker fluff his header, though it's moments like that which may cost him in what is likely to be a drama akin to Gerrard's Liverpool exit. With goals at a premium today, you obviously need no reminding that Watford have new signing Mario Suarez kicking his heels on the bench. Likewise, Chelsea have Eden Hazard if need be - certainly no shortage of talent ready and willing to make a difference tonight. The teams are back out on the pitch and Diego Costa stands smiling with his hands behind his back like a naughty schoolboy - Mike Dean has a quick word, and we're off again! 45' Watford 0-0 Chelsea: Chelsea start brightly as Oscar tries to release a teammate with a backheel, but Watford block. The Blues then swing a cross over to the centre, but Gomes easily collects. 46' Watford 0-0 Chelsea: Oscar breaks the offside trap and sees a shot blocked - the ball falls to Mikel, whose heavily deflected shot loops up towards goal and Gomes flicks it over the bar! 47' Watford 0-0 Chelsea: Terry is over quickly now to block out Deeney - both managers have obviously told their players to go for this one. 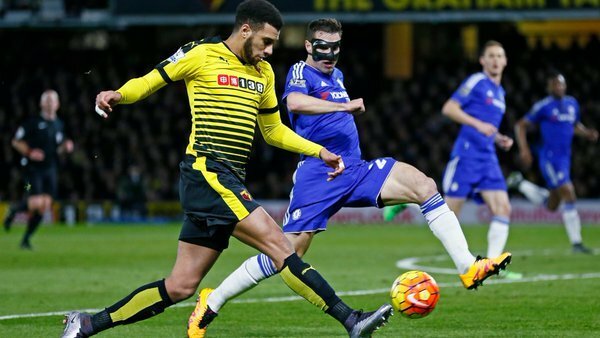 48' Watford 0-0 Chelsea: Deeney volleys wide! Zouma can only half-clear a header, and Deeney swings a decent effort a few yards wide of Courtois' right-hand post from range. 51' Watford 0-0 Chelsea: Watford go close again! Half the ground think this is in as Holebas thrashes an effort at goal and the net ripples, but it has hit the side netting. Great ball by capoue to set that up.